southbendforum.com • View topic - Why is the Bypass so Dangerous? Why is the Bypass so Dangerous? Re: Why is the Bypass so Dangerous? People don't realize how quickly conditions change up there. One minute it is clear and dry and you go around a curve and it is snowy and ice. This week, NewsCenter 16 has taken a closer look at the Bypass to identify possible reasons why the road is so dangerous during winter weather. In part three of our series, we're taking a look at what, if anything, can be done about it. On Super Bowl Sunday, INDOT was tuned into the Bypass as six plows worked side by side to clear the snow from shoulder to shoulder. "There's more attention paid to this road than any other roadway in the northwest Indiana district," said INDOT's Matt Deitchley. Indeed, not a single person we talked to -- from drivers to public safety officials -- had anything bad to say about the way INDOT responds to threatening weather. "When they know a storm is coming, they'll put those chemicals down that retard the freezing in the first place. Those are great. That's a big improvement over years back when we didn't have some of those kinds of things," said Asst. Chief Bill Thompson from the St. Joseph County Police Department. But face it: the bypass has been around for a lot of years. A ribbon-cutting ceremony from 1991 marked the eastward expansion to State Road 19. The start of construction dates back to the sixties. It's hard to imagine anything that could be done to improve safety here hasn't already been tried. "The snow fence that's up there by State Road 23 is our doing, and we continue to extend those things to cut down on the blowing snow that cuts across to make that roadway slick," Deitchley explained. And believe it or not, wild flowers have been planted at the interchange at Cleveland Road. In winter, the stalks mimic the effects of a snow fence. Still, last year out on the roadway, there were 76 documented weather-related collisions and countless close calls on the part of regular commuters. "I guess I did have a little bit of a close call, coming over that bridge right there over Mayflower," said commuter Nate Brunos. "You could feel yourself wiggle a little bit." "A large majority of people that travel the Bypass travel that road every day, at least five days a week, and some of them probably travel it seven days a week, to and from their homes. They know what the conditions of the road are and they've been like that for forever, so it's not new. They just need to use the common sense," explained Chief Dale Wedel with the Southwest Central Fire Territory. Figuratively speaking, the same people keep making the same mistakes, over and over again. At some point, addressing the situation here falls not on the shoulders of the road, but on the shoulders of the drivers. "It's the same old advice, but it's still the best advice, and that is reduce your speed and reduce the distance between you and the vehicle in front of you. Those are the kind of crashes we have. We have rear end crashes here, and we have folks that are going too fast for conditions try to make a lane change or a turn, and they slip on the surface because they're just going too quick," says Asst. Chief Bill Thompson. "We're already working as hard as we can to make this road safe, and it is a safe roadway. But any road can be unsafe in slippery conditions. We ask that you work with us and slow down to make sure all roads are as safe as they possibly can be," Deitchley says. Some local fire departments have set up a mutual aid system where one department will respond to the medical needs at an accident and the other department will send a big truck, for the sole purpose of protecting the first crew. They essentially use the truck as a road block so that no one else will crash into the crash site. TRAFFIC ALERT: South Bend Police are reporting several crashes and slide offs on the Bypass at Ironwood and Michigan both directions (east/west) at this hour. They're asking drivers to avoid the area or slow down so emergency crews responding are safe. The eastbound lanes of the Bypass were shut down after multiple crashes Wednesday. A police officer was involved in one crash just east of 23. There were injuries, according to dispatch. At this time we have no details on those injuries. 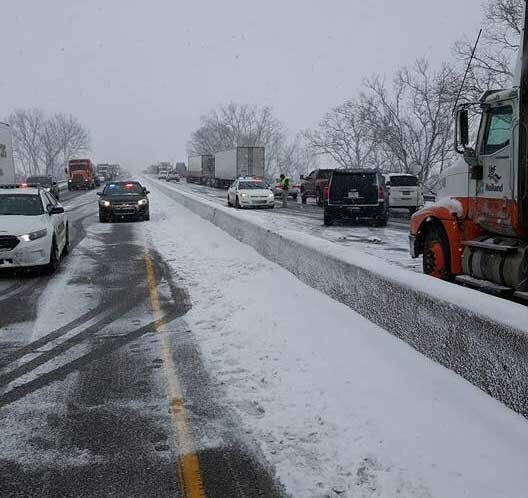 St. Joseph County Police say there were multiple crashes eastbound on the Bypass between Mayflower and U.S. 31 as well. In one of those crashes, they say a semi driver entered a whiteout, saw another semi stopped or slowed in front of him and intentionally hit the median wall to avoid hitting the other semi. As on any day when roads are slick, you should avoid the Bypass completely. it's an elevated highway in the middle of giant open fields, the only solution is to put in a windbreak with either trees or walls like when it goes over Miami street. It's because some people don't know how to drive safely and they have their heads up their arses! Bingo wrote: It's because some people don't know how to drive safely and they have their heads up their arses! it has a bit to do with that, people should not be going 65mph in the snow, but its the wind and the random white outs that kill everyone. The eastbound lanes of the US 20 bypass was shut down for just over an hour Tuesday after multiple accidents were reported, including one involving a police cruiser. 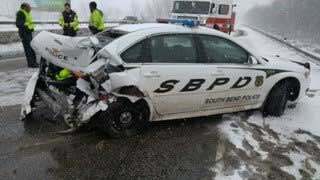 A South Bend Police officer was taken to the hospital after another vehicle slid into the rear of his patrol car. Two other people were also injured in the accident. 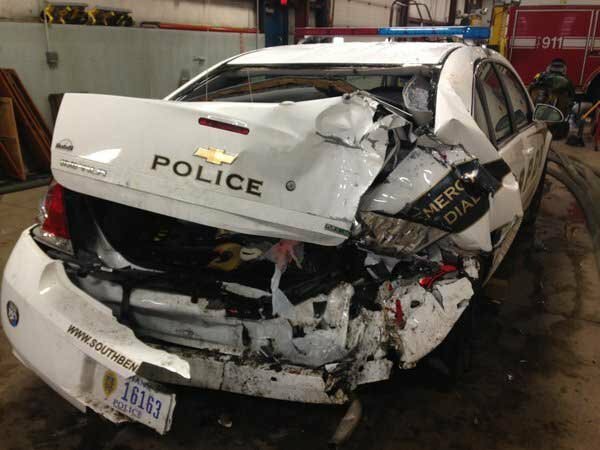 The city of South Bend says the officer was shaken up, but not seriously injured. He was released from the hospital. The St. Joseph County Police Department also responded to accidents on the bypass. "Sometimes we get asked the question why does it take so many police cars, fire trucks to work an incident up there. This is one of the reasons," said Assistant Chief Bill Thompson of the St. Joseph County Police Department. Thompson says it is important for drivers to pay attention, drive slowly in poor conditions and to move into the other lane if there is an accident ahead or emergency vehicles stopped ahead. "We want folks to do is when they see those lights at a distance start slowing down. Start making your lane motions to where you're in the right lane, the proper lane to get around it," said Thompson. Conditions on the bypass were poor all day due to the snowfall.